Performers include: Christina Ricci, Clea DuVall, Cole Hauser, Olivia Llewellyn, John Ralston, Dylan Taylor, Bradley Stryker, Jeff Wincott, Jessy Schram, Rhys Coiro, Adrian G. Griffiths, Chris Bauer, and Matthew Le Nevez. This dramatic series is a continuation of the story started in the TV movie Lizzie Borden Took an Ax. 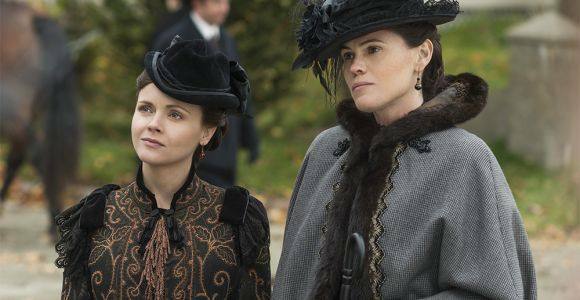 The show unveils a fictionalized account of actual events and people surrounding Lizzie Borden’s life after her controversial acquittal of the horrific double murder of her father and stepmother in 1892. The exonerated figure lives a life awash in newfound celebrity filled with scandalous love affairs. However, when numerous people close to Lizzie — ranging from her half-brother William (Andrew Howard) to Broadway luminaries and her business associate/underworld kingpin Mr. Flowers (Jonathan Banks) — start to mysteriously die under brutal and strange circumstances, legendary Pinkerton detective Charlie Siringo (Cole Hauser) becomes determined to prove her involvement in their ultimate demise. Emma (Clea DuVall) is Lizzy’s sister. Nancy O’Keefe (Jessy Schram) is an alluring and ambitious actress and dancer who befriends Lizzie. William Almy (John Heard) is the business partner of Lizzie’s murdered father, Andrew. Lizzie races to Boston, where Emma has taken refuge in the luxurious home of Adele Trotwood and family, with whom she has a very special connection. Stunned to find a vastly different Emma than the cherished sister she knew, Lizzie unwittingly leads Bat Masterson and Tom Horn directly into their path. However, the Trotwood family proves to be more than your average Boston Brahmins, posing an unexpected challenge to Bat and Tom. Trying to ease tensions, Emma makes an impetuous sacrifice. Lizzie plumbs the depths of her cunning to set out to ambush the gunslingers, and somehow pull the sister she dearly loves back from the abyss. First aired: May 24, 2015. What do you think? Do you like The Lizzie Borden Chronicles TV show? Do you think it should be cancelled or renewed for another season? Pleasantly suprised and absolutely hooked. Very disappointed to read it wont be returning for season 2.